This is the third book in the River of Time series. I have loved these books since the first time I laid eyes on them. If you haven't read them yet, you really should. I found so many things to love all the way through. Love, loyalty, time travel, action, knights in shining armor and a good history lesson... You just can't ask for more. This third book couldn't come fast enough for me. I was hoping for all kinds of resolution and good things. I was not disappointed at all. It felt so good to end the journey with Gabi and crew. Happily. :) The book is well written and the scenes are etched in my mind. I sure wouldn't mind reading another series starring Lia and Luca. I sure think there is more of that story to tell! Well, it could be that while I am utterly satisfied with the ending of Torrent, I still just want more. I really don't want to give away the book and the twists so I'm just going to have to tell you to pick up these books, starting with Waterfall and Cascade and ending with Torrent. They are one of my favorite series. I will be reading these books again. I'm also happy to say that these books are clean. I can recommend these books to all my friends and even my daughter's friends. To me, that is huge. 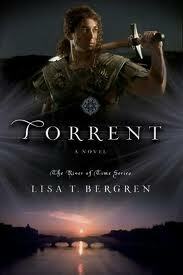 My most sincere thanks to Lisa Bergren for writing such great books and letting me read them. Torrent comes out September 1st! I love, love, love the River of Time Series! Ahh! This is a series I MUST get into! I actually bought the first 2 books a week or so ago because I found them on sale, and they've gotten such awesome reviews (like this one!) that I had to try it. Well, there is an impending hurricane this weekend. Guess I'll stay in and read! Thanks!